Whether motivating a group into action or expressing his love for his own Japanese American heritage through his involvement in a myriad of cultural activities, Matt Ogawa doesn’t have to look far for inspiration. Decades ago, his grandfather, the late Frank H. Ogawa, was a popular civil rights leader and longtime Oakland City Council member — one of the first Japanese Americans to hold such a position in a major U.S. city. Now the younger Ogawa is representing the Nikkei community as best as he can, albeit in his own way. To find Ogawa and his 100 kilowatt grin, one just needs to go to a local San Jose Taiko performance, an Obon festival or San Francisco’s Cherry Blossom Festival parade, where Michiya Hanayagi’s Japanese classical dance group is performing. Or they might pop in on a board meeting of the San Jose Buddhist Church Betsuin or the New Generation Nikkei Fund, and there is the seemingly ubiquitous Ogawa — who incidentally, also has a demanding career as a human resources department leader at Facebook. “My grandfather taught us to put yourself out there make sure that you are thinking about the larger picture and helping anywhere and everywhere you can,” Ogawa told the Nichi Bei Weekly via phone. As a child, he saw his grandfather’s positive influence firsthand at the Cherry Blossom Festival where countless seeming strangers would approach Frank Ogawa to say hello and get a first name response and friendly greeting in return, giving him a rock star quality. “It wasn’t until he passed away did I realize what he did for the community in general but also the Japanese American community specifically,” Ogawa said. While double majoring at San Jose State, Ogawa learned more about his own heritage — and that Japanese American communities were shrinking across the country. Along with his studies, he joined San Jose Taiko. 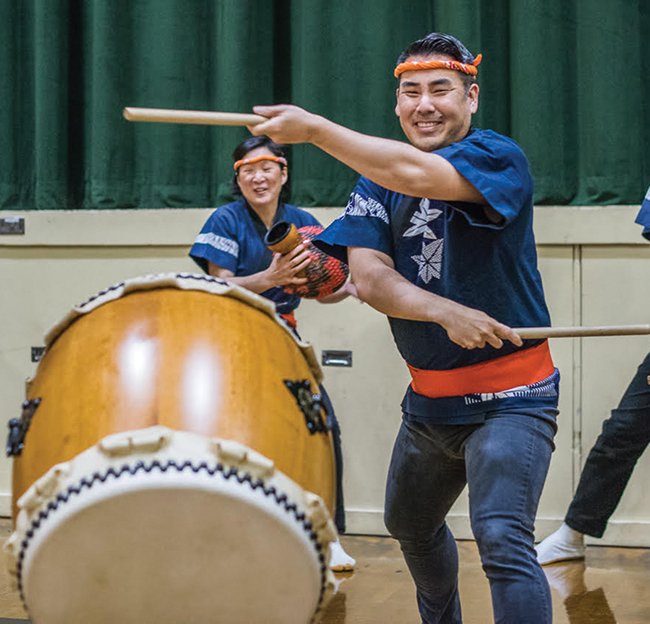 Founded by Roy and PJ Hirabayashi, and currently led by executive director Wisa Uemura, San Jose Taiko is celebrating 45 years of performing in nearly every state in the U.S., as well as internationally. In addition to being filled with talented musicians who are also crowd-pleasing performers, the group employed a message that kept Ogawa around for 24 years. Ogawa took the same approach when he began taking lessons and performing Japanese classical dance with the Hanayagi group in 1999. He continues to perform with them at festivals and at San Francisco’s Cherry Blossom Festival parade. Ogawa even choreographed a taiko drum number called “San Jose Bayashi” that incorporated classical Japanese dance. The San Jose Buddhist Church Betsuin, where Ogawa serves on the board of directors, has hosted odori and taiko performances for decades. Board president Dennis Akizuki explained that both his church and the Wesley United Methodist Church have been social hubs for Japanese American cultural events just like those around the country. He added that he is glad that younger generations are taking on leadership roles in the community. One group he has been a part of since the outset, the New Generation Nikkei Fund, is a philanthropy group made up of young professionals of Japanese descent who represent the three remaining Japantowns left in the United States, Los Angeles’ Little Tokyo, San Francisco and San Jose’s Japantowns, where Ogawa represents along with fellow members Tamiko Rast and Ellen Kamei. Working with like-minded positive energy individuals is empowering, he said.